The beachfront attractions lining Lake Michigan has long been an integral part of the city's overall appeal, and tourists visiting Chicago will often find themselves strolling along North Avenue Beach, and perhaps even being brave enough for a paddle or swim. You should also take time to go for a walk along Chicago's aptly named Magnificent Mile and indulge yourself in a spot of serious retail therapy. 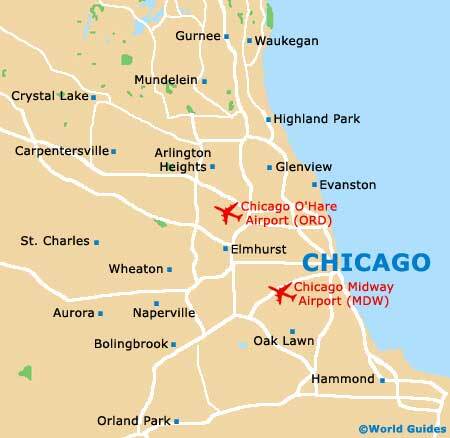 Other very notable tourist attractions in Chicago include the Hancock Observatory and its stunning panoramas, the very impressive Adler Planetarium and Astronomy Museum, and the McCormick Place, which has become a leading convention center. After a day spent sightseeing, what nicer way to spend your time than perhaps catching a show at the Auditorium Theater, where Broadway shows are regularly staged. 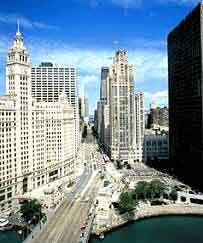 The city's famous Magnificent Mile is part of Michigan Avenue and become a Mecca for shopping in Chicago. Lined with literally hundreds of shops, restaurants, cafés, galleries and gift shops, the Magnificent Mile is a popular attraction for both tourists and locals alike. Situated on the north side of the city, the Magnificent Mile also features several large shopping malls, including the Place Mall and the Water Tower Place, which are filled with interesting shops and large department stores. The North Avenue Beach and Chess Pavilion is situated close to Lincoln Park. The beach is one of the many popular tourist attractions in Chicago and provides a place for tourists to swim, sunbathe and relax. Other highlights also include the recently renovated North Avenue Beach House, with snack bars and general facilities, and old chess pavilion nearby, where many entertaining chess matches take place. North Avenue Beach is situated near the North Side district, over the North Avenue Bridge. The Hancock Observatory is situated in the John Hancock Center on the north side of Chicago. Attractions include an impressive open-air sidewalk, talking telescopes, stunning views of the stars at night and spectacular panoramic views of some of the city's most stunning sights and buildings. The observatory is located on the 94th floor and is 1,000 feet / 305 meters above the ground. Admission: charge, discounts are available for children aged between 5 to 12 years old and seniors, children five years old and under are free. The Neighborhood Walking Tours cover many of the different areas in Chicago, with specific tours available. There more than 70 different communities living in the city, with many varied cultures, backgrounds and historical buildings to appreciate. These walking tours depart from the Cultural Center and last around four hours, visiting many of the city's main places of interest. The O'Leary's Fire Truck Tour provides and unusual and enjoyable way to tour the city and see the many sights on offer. Named after the woman who was blamed for causing the Great Chicago Fire in 1871, the O'Leary Fire Truck Tours provide tourists with a real insight into some of the most impressive sights and buildings within the city, as well as many other lesser known, interesting tourist attractions. Recently renovated at a cost of many millions of dollars, the Adler Planetarium and Astronomy Museum is deservedly one of the top attractions in the city. With many informative and interesting displays, including space travel, the universe, star constellations and the solar system, the main draw card at the Adler Planetarium and Astronomy Museum is the StarRider Theater, a virtual reality theater with regular shows. There is also a good gift shop at the planetarium, packed with astronomy related goodies. This famous theater was built more than 100 years ago and is situated in the South Loop area of the city. The Auditorium Theater underwent considerable restoration around 20 years ago and is one of the major tourist attractions in the city, staging some incredibly elaborate musicals. Some of the largest attractions at the Auditorium Theater include Les Miserables and many other traveling shows. Guided tours ofn the theater's interior are available. The McCormick Place is one of the top convention centers in the world. Named after the important McCormick family that once ran the Chicago Tribune, the McCormick Place is home to many events, festivals, conventions and attractions throughout the year, including the auto show, book conventions, food conventions, restaurant and motel shows and some sports events. Situated in the South Loop area, the McCormick Place is one of the most notable venues of its kind in the entire city. The Harold Washington Library is one of the largest libraries in the world and was named after Mayor Harold Washington, an important historical figure in Chicago. The library was built in 1987 and is home to a simply vast collection of over 12 million books, manuscripts, documents and archives, some of which are quite rare. Other attractions at the Harold Washington Library include a rooftop garden and beautiful, detailed architecture. The library is situated in the Loop district and guided tours of the library are available daily at 12:00 and 14:00.